Eastern Shore Toyota in Daphne, AL, is the place to buy high-quality pre-owned vehicles. We don't use dishonest bait-and-switch tricks or make you jump through hoops to get a good deal. 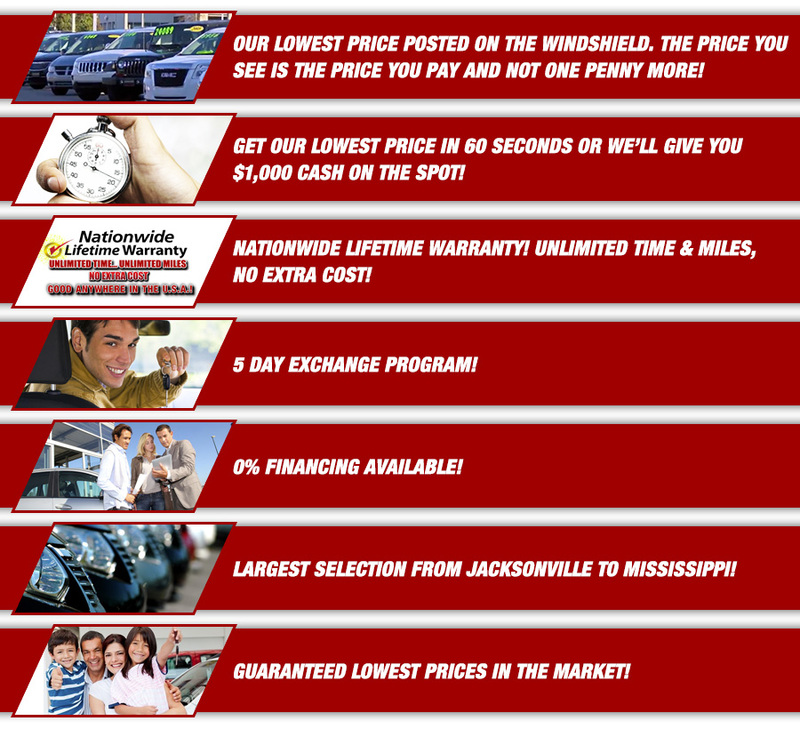 Every one of our pre-owned autos have our absolute best price displayed on the windshield. The price you see is the price you pay - no hassle, no haggle, just lots of low prices! You don't want to waste your time looking for the best deal on a used vehicle, and Eastern Shore Toyota is here to make the car shopping process as fast and easy as possible. We promise that you'll get our lowest price in 60 seconds, or we'll give you $1,000 cash on the spot. Imagine knowing right off the bat that the car you want is the car you can afford! Once you purchase your new-to-you, pre-owned car, you'll drive away with peace of mind with our Nationwide Lifetime Warranty. This outstanding warranty applies to all new Toyotas and eligible pre-owned vehicles for unlimited time, unlimited miles, and at no additional charge. It covers parts and labor on all approved engine, transmission, and driveline failures including applicable seals and gaskets. Even better is the fact that it's good at participating dealerships all over the United States! A test drive gives you an idea of what a vehicle can do, but once you drive it home, you're still testing it out - getting used to where the pedals are, adjusting the seats and steering wheel, remember how to turn on all the bells and whistles. If for any reason within five days or 100 miles after purchase (whichever comes first) you are unsatisfied with your vehicle, you can exchange it for one of equal or greater value and pay the difference (one-time only offer). Think 0% financing is just for the new vehicle owners? Think again! It is possible to get a 0% auto loan for a pre-owned car from Eastern Shore Toyota. Run the numbers through our payment calculator to see how much money a no-interest loan would save you, and then start the financing process by filling out our online application. Whether you're looking for a sedan, hybrid, crossover, SUV, truck, or minivan, our pre-owned superstore has over 500 pre-owned vehicles in stock - the largest from Jacksonville to Mississippi - and our entire inventory is listed here online for your research. Once you find one you want to see in-person, our friendly sales team is here to show it to you at our dealership, located on 17 acres of WOW between Mobile, AL, and Pensacola, FL. At Eastern Shore Toyota, our goal is to make car buying easy, and when you go somewhere knowing that you're going to get the lowest price on what you want, you save a lot of time, effort, and, most importantly, money! That's why we mark every one of our pre-owned vehicles at the absolutely lowest price in the market - guaranteed. Why buy anywhere else? Eastern Shore Toyota has the best of the best pre-owned vehicles. Let us show you! Call us at 866-579-9145 or visit our showroom at 29732 Frederick Blvd., Daphne, AL 36526.